I was recently inspired to make this for a potluck. Towards the end of these parties, my friend pulls out liquid nitrogen to make ice cream using a stand mixer. I brought his as a base and got some good feedback on it, so I made a second batch at home. I started by roasting chile ancho and a stick of canela in the oven until I could smell them from the oven and the ancho started brown. At this point the ancho is very dry. I broke up the chile and canela in a pot of half cream and half whole milk. The color of the cream began to turn brown as it came to a simmer. I shut off the heat and let it seep for 20 minutes. 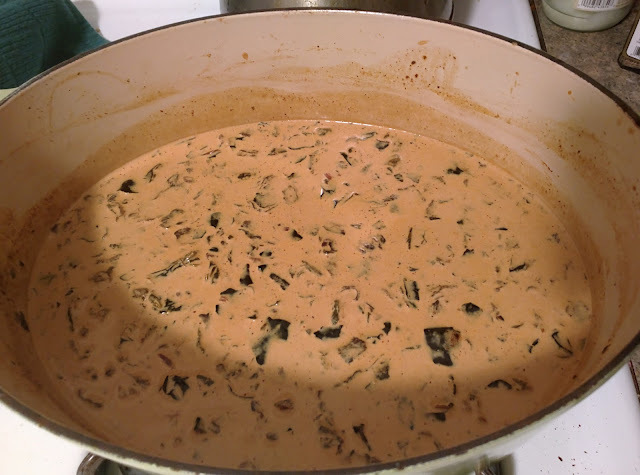 I removed about half of the chile and larger pieces of canela and blended into the cream along with a couple of pieces of jamoncillo and Mexican chocolate. I let the mixture completely chill before placing in an ice cream maker. I let it run in the maker for about 20 minutes. 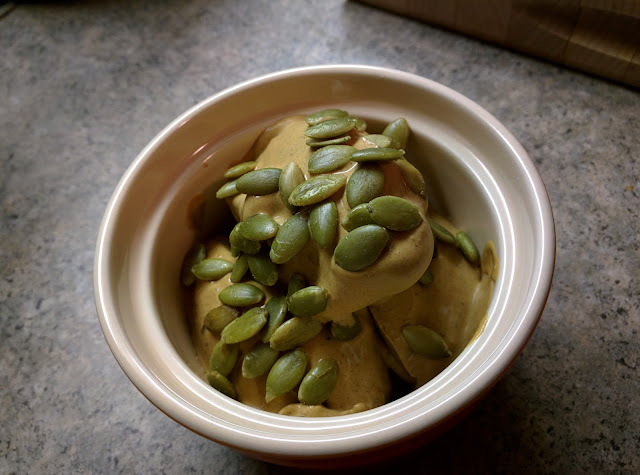 To sample, I scooped a couple of spoonfuls into a bowl and topped with roasted pumpkin seeds. 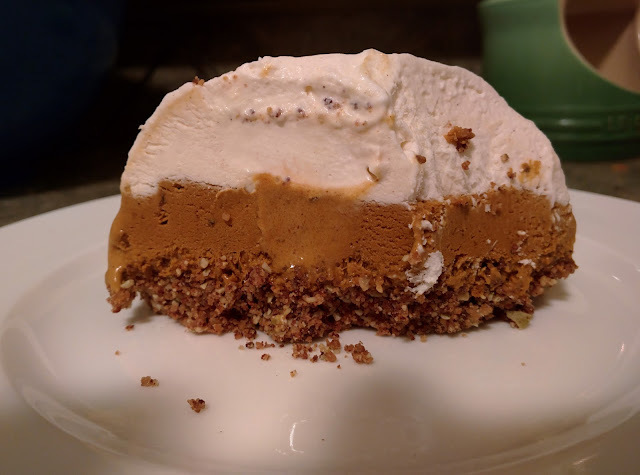 Update: I used the ice cream recently to make a dessert made up of leftover desserty things. I first made a whipped cream with maple syrup and cinnamon one day that sadly went unused, so I placed this in a bowl to freeze. The next day I let some of my ancho ice cream soften so I can spread it on top of the frozen whipped cream. On top of this, I pulverized 2 leftover chocolate chips cookies with some roasted pumpkin seeds. After weighing this down on top, I froze everything together. The result is this random weekday dessert! - Toast ancho and cinnamon stick over a griddle or a hot oven, turning occasionally until you see them start to get a deeper color and you can smell the aroma of the chile. - In a separate pan, heat the heavy cream and milk until it begins to simmer. Break the chiles up in the pan along with the cinnamon stick split in half. Turn off the heat and let it steep for 20 minutes. - Strain the mixture through a fine mesh strainer, pressing as much of the chiles out as you can. Save half of the chile and cinnamon and blend back into the milk mixture. -Bring the mixture back up to temperature. Break up the tablet of chocolate into the heating ancho milk, add salt, and blend until incorporated. - Cool and make ice cream! note: Abuelita has sugar and I found the addition of this to be sweet enough for me, but adding sugar during the last step is also an option.